Tamdhu single malt whisky has been given a new brand identity following the relaunch of the Speyside distillery. Good, a Glasgow and London-based design agency, is behind the campaign. Designed to maxmise shelf impact, the new packaging communicates the brand’s values and provenance with a tasteful, textured black, white and gold tube, illustrated monograms and an elegant glass bottle, inspired by the Victorian era. Heritage combined with innovation and enterprise are the qualities that helped to inspire the new identity, articulated in the campaign slogan ‘Can Dhu’. The positioning is carried into other touch points such as digital, social media, promotional and advertising. The Tamdhu Distillery on Speyside, whose Gaelic name means “the little dark hill”, was ‘mothballed’ in 2010 but was given a new lease of life after being bought from The Edrington Group by Ian Macleod Distillers. The Good team was chosen following their other work on developing a refreshed positioning and packaging for Glengoyne, Ian Macleod’s other premium malt distillery. The agency, which has designed a number of other major whisky brands, sought to combine elements of Tamdhu’s past and present, including the enterprising spirit of its founders, the rigour of the distillation process and the quality of its location, to create a bold, modern identity that also reflects its history and provenance. Keith Forbes and Chris Lumsden, co-directors of Good, and Darren Adams, the creative lead on the project, visited the distillery to steep themselves in its history before devising a suitable brand image. 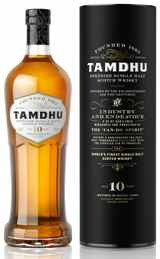 Says Forbes: “Born out of a time when Scotland led the world in many fields of endeavour, Tamdhu embraced technology and innovation. We wanted to capture that spirit that anything is possible when you put your mind to it. Tamdhu 10 year-old Speyside single malt Scotch whisky is available from Waitrose, specialists and independents across the UK from 6th May, 2013 with an RRP of £34.99. It will be distributed globally over the coming months. In addition, a special commemorative 10 year-old bottling, which is matured in 100% first fill sherry casks, has been released by Ian Macleod Distillers. Only 1000 limited edition bottles are available to buy online priced at £100.